Starting the brand new week with this colorful summer eye look that I did using Seasoul Dual Eyeshadow. I got this eyeshadow duo in my May Fab Bag. 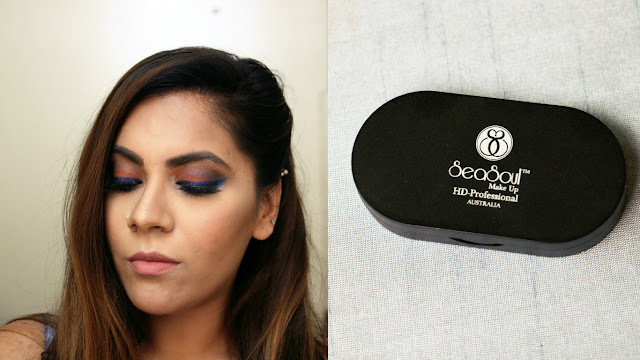 Seasoul Dual Eyeshadow costs 900 INR and the SS19 duo has a bright coral orange and a neutral beige shade. The colors were so pretty that I had to give it a try right then. I used the bright coral-orange on the lids along with a blue shadow and the beige one under brow bone. While I was using it I realised that both the colors are completely different in terms of consistency, fall out and pigmentation. So these are mineral eyeshadow, I had super high expectations from them but sadly they did not turn out the way I expected them to be. The orange one us matte , feels very good and smooth but quite chalk to apply. The shadow does not transfer well on lids, the color payoff is not good. I had a really hard time packing it on for this pop of color. Its difficult to blend. The beige one is semi matte, the consistency is better, its not pigmented but still transfers and blends better than orange one. 5. Shadow vanishes very quickly from lids. 6. If working with brush, it does not go even on lids. 7. Expensive for this quality duo. Seasoul Dual Eyeshadow was one product , I was so sure will work amazingly, but they did not turn out well. If you are looking for good quality eyeshadows, I would say skip these. you are gorgeous. Thank for sharing.